Wouldn’t it be nice to have your own personal minions to do your dirty work?! I kept telling Matt I wanted a bunch of the ones from “Despicable Me” & he told me I should make my own…so I did. I realized the minions are the same shape as my Pocket-Sized Robot so it was easy to get the basic body down. The overalls required a little intarsia in the round (though you can do duplicate stitch if you wish). The trickiest part was really the goggles. I knew embroidering them on wouldn’t give them the 3D goggle effect. I thought about using wiggly eyes & just painting a little silver around the edges but I couldn’t find the right size. Then I thought of buttons. I found flat white buttons with a shank on the back that would work just right. Building up the back of the buttons with glue after attaching them gives them stability & more of the goggle shape. Its a little tricky but I like the result. If you come about with another option I’d love to see it. I used Aran weight yarn to make my minion on size 5 needles. My gauge was about 5 stitches per inch. My minion is about 4 inches tall & 6 inches around. You can use any size yarn & needles you want just make sure you are getting a tight knit so the stuffing doesn’t show through. The bigger the yarn & needles the bigger the minion & vice versa. this is showing in movie now here, my girl loves them all .thanks. I am so glad you posted your pattern, I've been dreaming about my own minions ever since I saw yours! Thank you!! Great pattern and thanks so much for sharin! Great pattern. Thank you so much for sharing this! I love your minion! Would you mind if I did a post about this on my blog with a link to yours. You would get total credit!!! Threads of Inspiration – You can totally do a post on it, just don't reprint the pattern link people to my site to come & get it. Thanks! Kat, Thanks, I will definitely just put up the link, but also a photo of the cute little guy. I believe I will put it up today. It is so adorable! Sadly, I don't knit that well, but it is so great I must share it! Yay! I saw a link to this post on the Craftzine blog this morning. I love that they gave you a shout out. Are there any patterns out there for the short, squat minions? I love this and am trying to have my sister knit me one! THANK YOU! I'm so happy with my minion! and I hope he's happy with me. I'm a novice knitter, so your site is a huge help. Adorable!~ I am making minions for a gift, and devised a pattern, but was haing trouble with the eyes, love your solution!! Love the knitted minions. I can't read a chart too well. Can you write up like a pattern? It would be easier for me. Thanks so much! My parents saw the pattern when I was looking at what other things you had (I maded the Grumpasaurus for my baby brother) and they both wanted me to make each of them one! I loved reading your pattern and directions. I think you came up with a wonderfully clever way to handle the eyes! They look great! Thanks very much for the pattern – I went a bit mad and made five yellow minions, then modified the pattern to do 3 purple (evil) ones. Everyone wanted one! I just love Minions they rock. I’d like to make all sorts of them. Personally I’m not a knitter but I can, so I’ll make this cute fellow. I still have to get all the Despicable Me dvds as well. 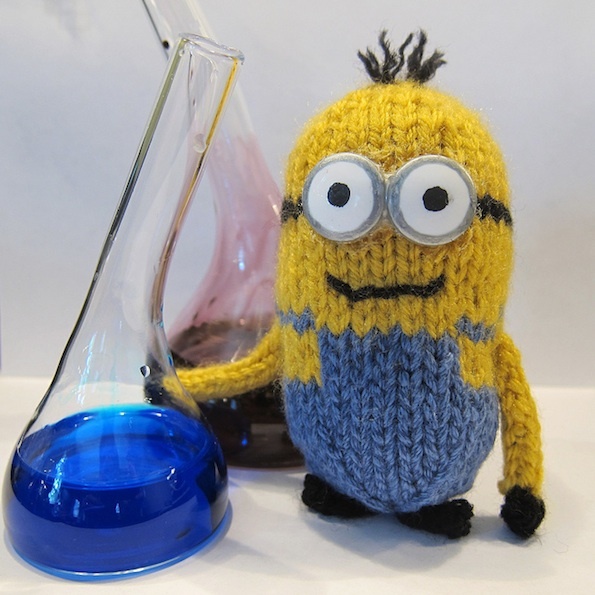 I would like to knit the minions as part of charity work for Cats Protection and Cavalier Rescue. This would mean selling them at our fairs with all funds going to the charities. Would this be ok with you? Thank you so much for sharing the pattern for the knit minion. I have been looking for a knitting pattern for them for some time without success. You’re welcome. I know it seems like a lot of the patterns for things like this out there are crochet. I’m not sure if it would work because I’ve never tried it. Give it a go. I love these. My daughter-in-law saw an idea for making minions of our Easter eggs this year and they were adorable. So are these. I can’t wait to try them. Maybe they will be in people’s stockings at Christmas. Thank you for sharing. They are a great little stocking stuffer! One knitter made little Santa hats for them. I have seen some really cute ones done both ways. Glad crochet is working so well for you. Love to download the pattern BUT don’t like having to have all the comments as well. Not sure what you mean by the comments. Comments from readers don’t show up in the pdf download.